Families today spend less quality time together, contributing to negative youth development, poor family fitness and lack of family communication and trust. This is a growing issue because when there is a lack of family quality together time many youths get involved in risky and delinquent activities, family’s health and wellness is passed over and forgotten, and family's either do not trust one another or do not know how to work together as one. ‘Families that eats together, stays together!’- This quote has become far than redundant. With such a fast moving world, in fact, an individual eats one in every five meals in her car or commute vehicle/office desk, one in four individuals eats at least one fast food meal every single day. There is no time to sit down with your family and share a meal. Apart from meals, however technology has created chaos and diminished family time, encouraging kids to make time for family participation is a way to guide them toward a lifetime of health and well-being. Families that play together, have fun together. While there are countless ways a family can get bond together to increase strength and longevity, here are some simple suggestions on how to easily incorporate these methods into your everyday life. Mandira Bedi will be there with her son Vir at the Durathon! Getting active together doesn’t have to be time consuming. Even 30-60 minutes, three times a week as a family can be beneficial. Maximize your time but keep it real to your daily routine and flows of your own family. Block out time after-school, after-dinner and at least one day on the weekend. Remember to a child the word ‘Love’ is spelt T.I.M.E, and the best way to spend the coming Children’s Day is by spending the day running together in bunny ears and having fun together. 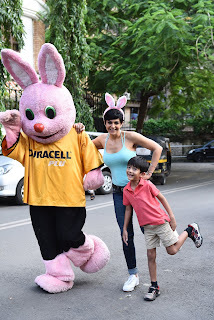 Duracell, the iconic consumer battery company is organizing the ‘Durathon’, Mumbai’s first family run; on Sunday, November 12, 2017. Just like the famous running Duracell Bunny kids and parents will have the opportunity to show how they can go stronger for longer as they unlock their inner power when finishing together a 2K or 5K run. Durathon is a lovely platform for every family to come together and increase bonding.